Boxing is one of the best sports for all round fitness. Our boxing fitness sessions will differ than the usual boxcerise classes as we’ll deliver some correct boxing technique coaching whilst still working you hard and mix in a good bit of circuit training. Whilst we encourage people to work at a level they feel comfortable at, it’s not for the faint hearted! We welcome anybody of any age, male and female, to join in and have fun whilst learning some boxing and getting fit. For more information call us on 07554453862 or just come down on a Tuesday or a Friday at 6.30pm – 7.30pm each week. We are proud supporters of Boxfit UK’s campaign to encourage women to start boxing. Boxing is a universal sport and we welcome women to join us in our classes and competitions. 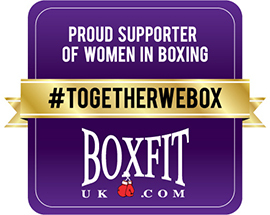 For more information on the campaign and how you can get involved, visit the official #TogetherWeBox page and follow the hashtag #TogetherWeBox on Facebook, Twitter and Instagram.